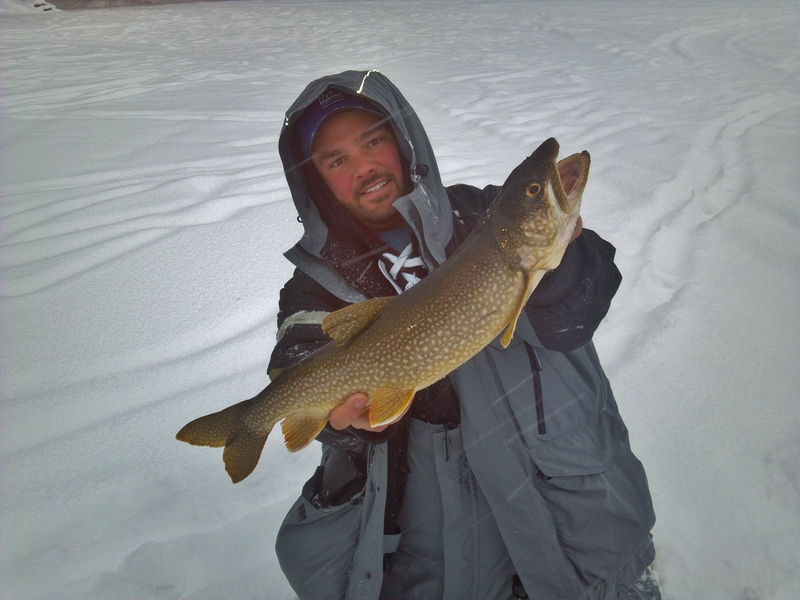 With the second qualifier for the Vermont Sportsman Hardwater Tournament Series at Larabees only a day away, the pressure to find fish was tense. While Bobby was at work, I made the two hour drive with a buddy to see what it was all about. Having never seen this bay with ice on it, I knew that I had my work cut out for me. I had reviewed aerial images of the bay and drew up a plan of attack. I figured work shallow to deep in hopes of stumbling into a pattern. With intentions of searching with a camera rather than fishing, I got to work. Using the camera was tough because the water was pretty murky. There was a few feet of visibility at most. I worked over a few hundred yards of weeds before I got into some fish. At first, it was just bluegill, but as I worked further into the patch, crappies were cruising in decent numbers. Knowing I had to catch some to figure out what they would bite and get a size reference, I started fishing. It didn’t take long put some fish on the ice. Knowing that I could get back on them, I moved on. Working the remainder of the water that was in the fishable area, I found a big school of crappie that were very hungry. The numbers were good and the size was slightly better. The remainder of the day was spent searching for the best pattern. I found that the fish were aggressive when located and short weeds on the edge of dense weeds was the best bet. Tomorrow should be a good day! 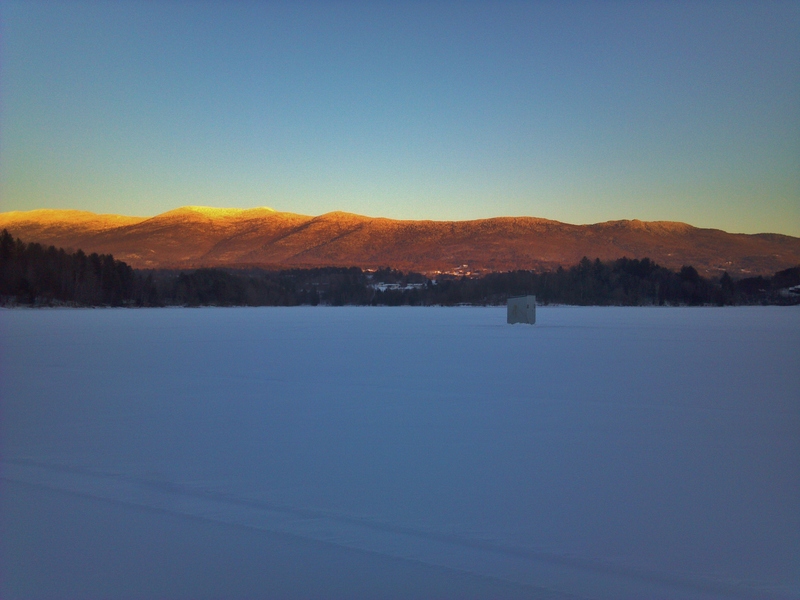 1-21-14 – Cold Keeps Coming! While much of my winter up to this point has been spent chasing panfish, with trout season now open, I can access some great bodies of water. The temperature today was never suppose to get above 0 so I knew that I needed a location that I could sit in one hole and catch fish. With the cold in the air, I was glad to have spent the night at work making it so that I didn’t feel like I had to be on the ice early! I decided to fish for smelt in deep water. The bite was decent but I was having trouble with consistency due to brown trout and perch. In the past, I have fished there with tip ups and never had much for luck. Today seemed different though. I used my camera and found that the water was pretty murky and light disappeared about 12 feet down. I didn’t catch anything below that point all day. 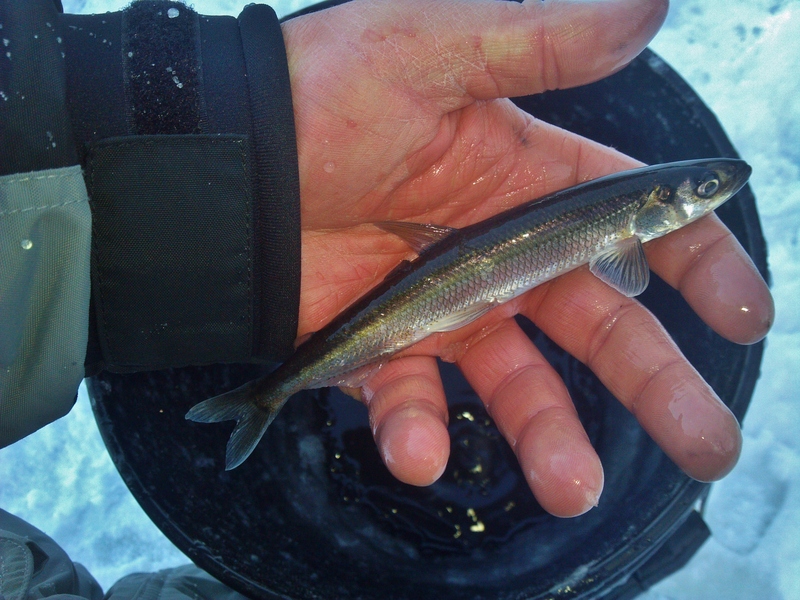 The majority of the smelt I caught were within 2 feet of the ice and were very willing to bite. Throughout the course of the day every 15-20 minutes I would have bigger fish come through and chase the smelt out. Mostly it was perch but the browns were cruising right under the ice. I hooked up with 5 of the dozen browns I saw but didn’t land any because of my light line. The perch on the other hand were plentiful and chunky due to the smelt. 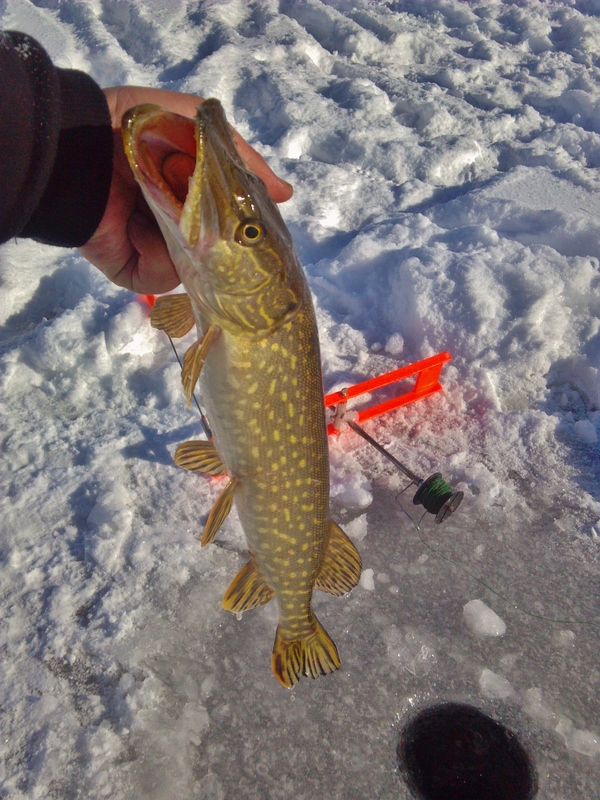 Picking at the smelt was only possibly with a super small hook today. I used a size 18 jig for the better part of my trip. A cold day warrants spending the day in a shelter. For this day, four of us sat in my Clam Big Foot XL4000T. We had a spread of tip ups out and the action was pretty good. There were loads of perch around and they were willing to bite. Mainly we were running fatheads but we also had medium shiners on a few in case any larger fish went by. For the most part, our action was steady for about two hours. After that, things slowed up pretty well and the cold really had us sticking to the shelter. 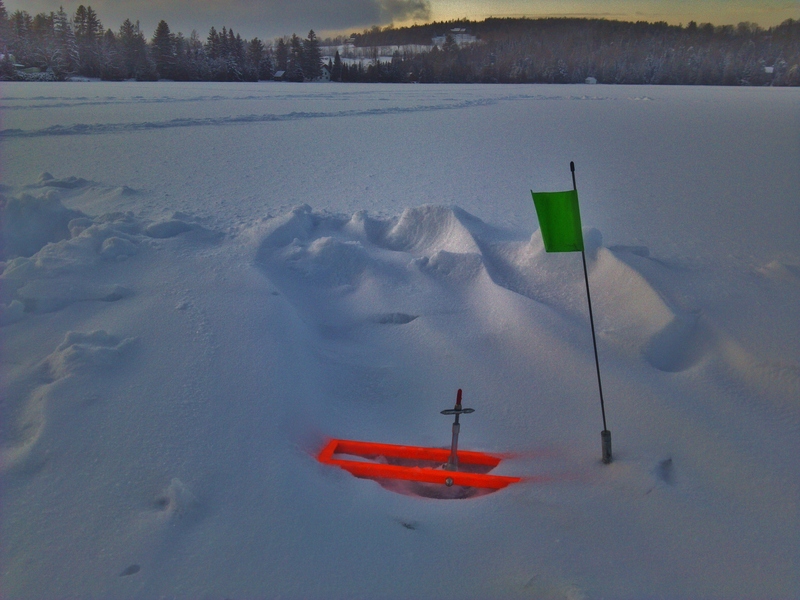 It wasn’t taking long for the holes to freeze up solid enough so that we had trouble busting them free. After a few hours of very slow fishing and cold weather, we packed up out gear and went out bite a buffet. The fish in the tank had us wondering what they were biting on! The temperature has been dropping the last few days and so far I have stuck it out but have had a tough go at it. Yesterday my buddy left the keys to my truck in the bed, under the hardside tonneau cover and somehow locked the tailgate. Out of cell service and miles from the nearest store, it took about 5 hours to get the situation resolved. Having to wait for assistance, we stayed close to the truck and made the most of it. 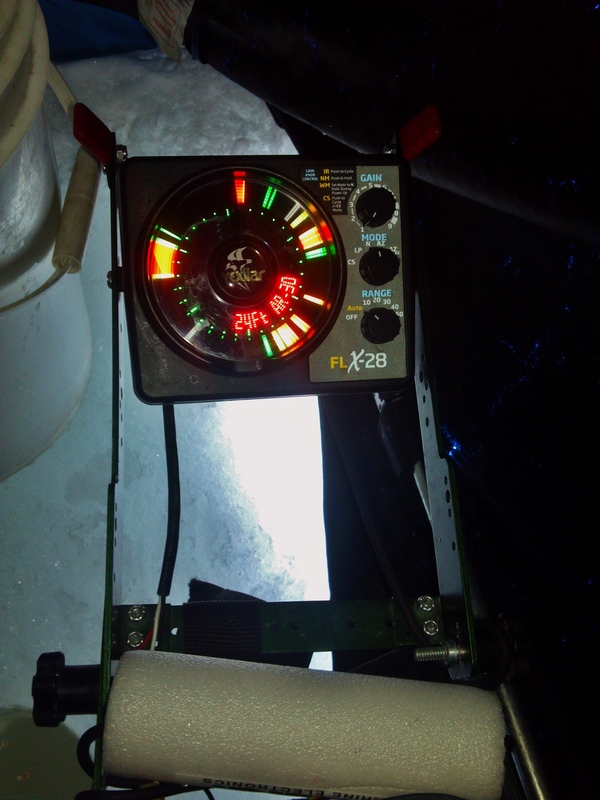 During that time I was able to stick a few smelt and lakers while fishing shallow. By shallow I mean less than 3 feet of water. Probably the toughest part of the day was the numbers of lakers I hooked up with and wasn’t able to land. While I was gone trying to find a phone to use my rod ended up in the water and the reel froze up solid. 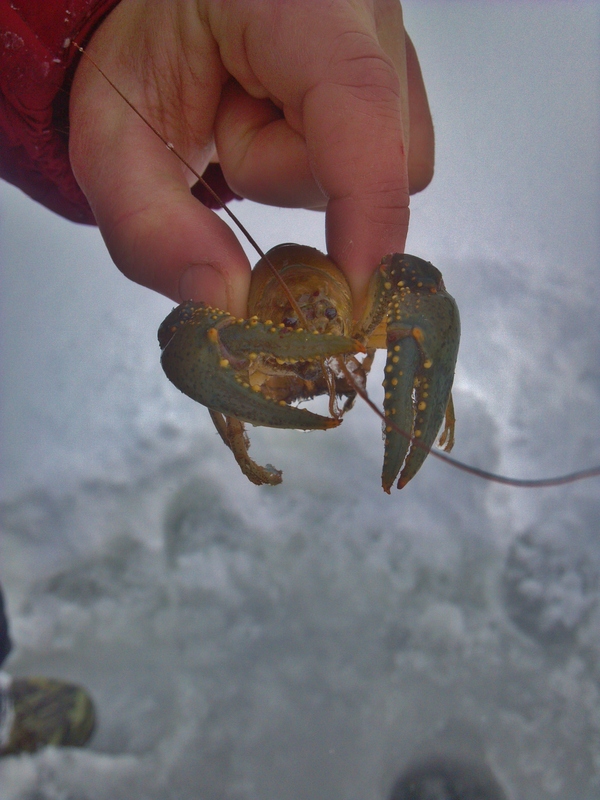 With no access to a backup rod, I was trying to lift lakers with no drag. It was probably comical to the people watching me! The smelt were thick but the bite was tough. 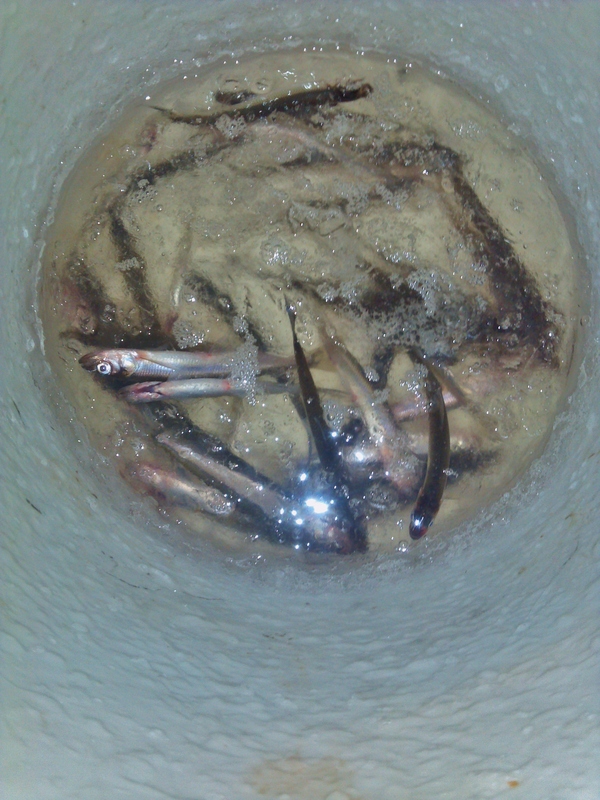 Not being able to trek out to my coordinates with the bucket of smelt sure was disappointing!